Yet another demo hits the market today in the form of KILLZONE 2. Unfortunately it is only available for UK customers and those who have a pre-order code from GameStop. This PlayStation 3 exclusive follows the events of both KILLZONE and KILLZONE: Liberation (PS2 and PSP respectively) as the ISA forces storm the Helghan home world. Early reports indicate that KILLZONE 2 may be the best looking console game of this current generation. PS3 owners, this seems like the perfect game to show off on your HDTVs. I have not yet had a chance to play the demo, so I’d like to hear our readers’ thoughts on it. How do the graphics hold up against other PS3 and Xbox 360 titles? How is the game play? Please comment below. You’ll be hearing my thoughts later this week. 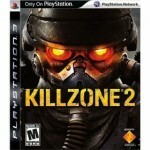 KILLZONE 2 has been rated M by the ESRB and will be available only for the PlayStation 3 on February 27th. Thanks to Jamie & Travis for checking your PSN accounts. yup everything is great about that game every1 need to trie it…. its to good to be true…… its a masterpiece….. its a revolutionary…. its the next best thing….. its the savior of ps3 well naw many games is but yeah thats the first on the list… its k-i-l-l-e-z-o-n-e-2… pick it up with a ps3 if u dont already own it….. and then ill meet u up in the zone…. Great graphics, but controls that would need warming up to.